The Midland County Emergency Food Pantry Network (EFPN) recently partnered with the West Midland Family Center to feed 237 families representing 748 individuals. Each year a different local Midland church anonymously purchases the food for the Food Bank of Eastern Michigan for the giveaway. The type of food donated varies from year to year, but typically includes lots of fresh fruit and vegetables like potatos, tomatoes, mangos, onions and reclaimed food from Hidden Harvest. The food giveaway lasts about 2-2.5 hours but it takes an army of people putting in a long days work to host the event. The food giveaway made for a very busy day at the West Midland Family Center. People lined up outside the Center as early as 5:30 a.m. in hopes of signing up to receive some much needed relief from the economy. Cars filled the Center parking lots, and any lawn space or spot along the road, that could possibly accommodate a vehicle. People lined the halls throughout the day and rooms were “standing room only” as people took refuge inside from the early morning rain. Council on Aging set up large pots of coffee for those who awaited the 1p.m. food giveaway start time. "The most challenging part of hosting an event like this," explained Diane DeMott, WMFC Administrative Assistant, "is crowd control and parking control." "The weather can also be a challenge,"explained DeMott. "The last two years we have had to go inside because of rain which really stretches our resources when it comes to finding room for all the people and all the food." Rain couldn't hamper the enthusiasm of the 50 or more volunteers who came out to lend a hand to help those in need. Volunteers and WMFC staff members scurried about all day setting up tables and chairs in preparation for the the massive amount of food that would soon be delivered by semi truck and a large commercial truck from Hidden Harvest. 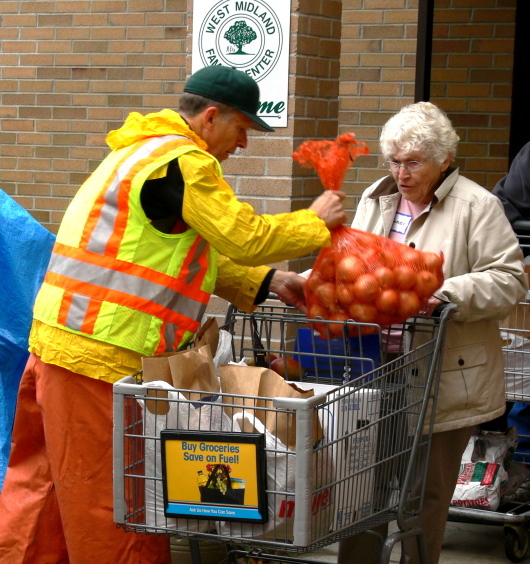 At the end of the morning, when the food was finally delivered, the army of volunteers, equipped with shopping carts, sprung into action. "Getting enough volunteers to help set up before the pantry people get here is also challenging," continued DeMott. "It takes at least 60 volunteers to pull this off. Somehow, every year, enough volunteers show up and make it happen...we could not do this without them. The day has it's challenges," continued DeMott, "but at the end of the day it's very rewarding to get good, nutritious quality food into the hands of those who need it."